The Barbaresco Docg I Patriarchi is the result of a blend fromNebbiolo grapes grown in different cru-vineyards: Rondò and Tetti in the Neive area. Elegant and full-bodied, it can display a range of aromas perfectly balanced between spices and ripe red fruit - the same harmony of body, pleasant tannin and freshness you can feel in themouth. Let the boneless lamb shoulder rest in amarinade of garlic, capers, a thyme sprig, pepper and some oil for 8 hours. Drain the lamb removing the capers, garlic and thyme; adjust salt to taste and set aside vacuum-packed. Steam at 158 °F for 12 hours. Finely slice the spring onion and stew in a frying pan with butter and a sprig of mint for 5 minutes on low flame. Add the peeled beans, adjust with salt and pepper. Pour some water and cook for 5 minutes. In a saltière (low-sides and thick bottom saute pan) heat the oil, roast the lamb and brown it on each side. Add some butter, thyme, a garlic clove in order to flavour the meat. 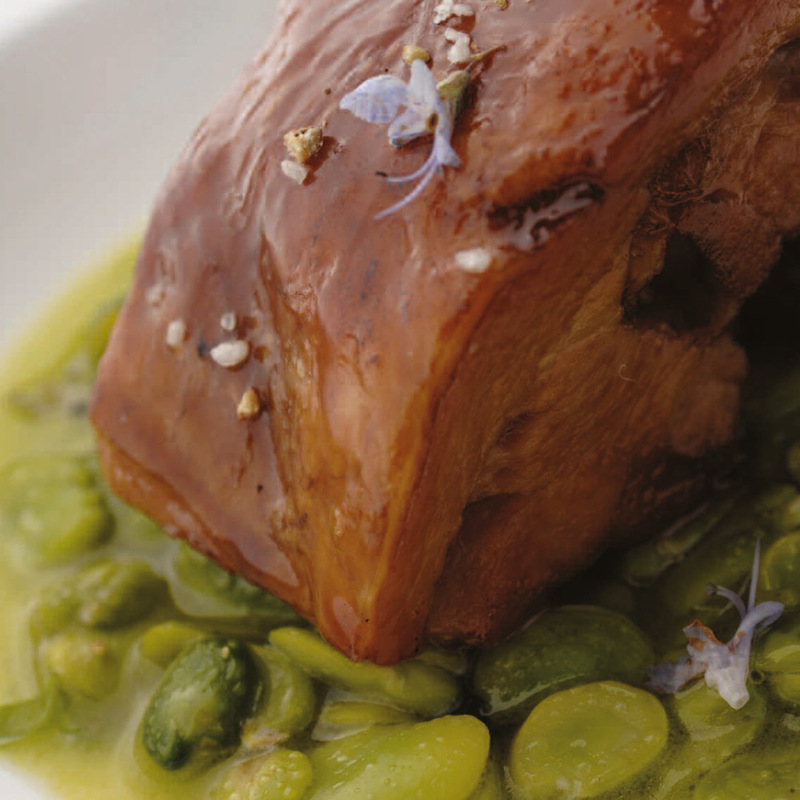 Place the beans and the meat lamb in a plate, sprinkle with lamb cooking juice and finish off with rosemary flowers.